I was very interested in this book because it’s considered a Japanese modern Classic and is written by a very popular Japanese author. Considering how weak my knowledge is in Japanese literature, modern or otherwise, I thought reading this book would give me an insight into the same. This book could be sensitive, silent, hopeful and depressing all at once. Schoolgirl is a basically a day in life of a schoolgirl on the verge of womanhood. Her mothers indifference following her father’s death leaves a huge void in her life leaving her alone and vulnerable. Beneath all the loneliness she is also very depressed. She is at a stage in her life where her thoughts are full of contradictions. Her view of the world is hopeful and depressing at the same time. Plot is something that is very important to me in a novel and Schoolgirl definitely doesn’t have one. But my main problem with the book is that I couldn’t relate to the central character which is perhaps no fault of the author or the translator. For someone who doesn’t get depressed ever (touch wood), I didn’t understand how the girls thoughts veered towards depression so often and for no reason. I know there are people who suffer from depression and perhaps it is as unexplained as it is for this girl. The back of the book says that Osamu Dazai suffered from depression during his lifetime and he died from a suicide attempt after several unsuccessful ones. There must be a few of his thoughts reflected through this young girls vision. Overall I wasn’t as impressed with this book as so many others have. But I’m glad I read it. I loved Memoirs of a Geisha, both the movie and the book. 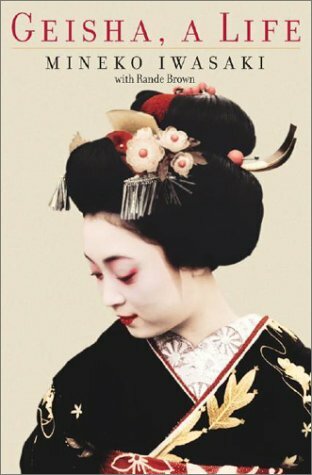 So when I found out that the Geisha on whom the book was based on or rather inspired from has written an autobiography, I was thrilled. Apparently, Ms Mineko Iwasaki was very upset over the way Geisha’s were portrayed by Arthur Golden and that he breached an understanding that her name was not to be mentioned anywhere, but he did, in the book as well as in interviews. She also got death threats from people who thought she had defaced Japanese culture. So she decided to write a book of her own. Iwasaki’s parents were distraught when she decided to become a Geisha when she was just 5 years old. How a girl so young could make such a decision and how could the parents agree to it is something beyond me, even though she has tried to explain it. She goes to stay in an Okiya (a geisha house) and she is initiated into the trainings and numerous classes when she turns six. A woman who is training to become a Geisha has a very disciplined life. There is traditional dancing, singing, playing instruments and also studying. Would-be Geisha’s are allowed to study until Junior High, in fact it’s kind of a rule. Iwasaki excels in dancing and she is introduced as a maiko when she is 15 years old. After a few years of working as a maiko she becomes a geiko at age 21, which are the same names for a Geisha, just different hierarchies. She soon becomes one of the top geisha’s in Gion. In fact, today she almost has a legendary status. What surprised me most was how systematic and well organized the world of a Geisha is. There is a list of all the girls that are going to come out as maiko’s. There is a Kimono Dealers association. There is a very strict hierarchy which if broken can result in serious consequences. The earnings of all the geisha’s are reported to the Geisha Committee (I think that’s whats it is), so everyone knows who the highest earning geisha for a particular year is. The Geisha world itself is so complicated or may be I felt that way because I had not heard a lot about it. There is a rule of what kind of and what design a Kimono can have depending on seasons. Same goes for hairstyles and ornaments. It was exhausting just reading about it. It is very clear that Ms Iwasaki loved and respected what she did and she has tried to dispel all the myth’s regarding geisha’s. She often sounds a bit egoistic and someone that could do no wrong. But we also need to understand the world she lived in, a world when no one, including one’s sister cannot be trusted. She lived by the motto: The Samurai betrays no weakness, even when starving. Pride above all. I can understand how easily pride can be mistaken for ego in the geisha world. My Kimono was made out of figured satin in variegated turquoise. The heavy hem of the train was dyed in shades of burnt orange, against which floated a drift of pine needles, maple leaves, cherry blossoms and chrysanthemum petals. My obi was made of black damask decorated with swallowtail butterflies. I wore a matching obi clasp of a swallowtail butterfly fashioned out of silver. There are many passages like these which some people may find dry and boring. But I loved them, it helped me immerse myself in the book more. In fact 2 days after finishing this book I struggled with picking up another that was as engrossing as this one. If I have to compare this book with Memoirs of a Geisha, I would say both are very different from each other. In Memoirs of a Geisha, we get a young, naive and endearing Sayuri, where as here we get a strong willed, dedicated Mineko. Arthur Golden seems to have picked the main storyline from one of the minor characters and mixed it with Iwasaki’s story to make it more dramatic. If you are looking for a “Memoirs of a Geisha” kind of book, you will be disappointed. But both are brilliant in their own way, one as page turning fiction and one as a real look into the Japanese culture. The simple fact that Geisha, A Life is a true story gives it a different feel altogether.